English author and journalist; born in London, England; educated at University College, London, where she obtained scholarships in Hebrew and German. She devoted herself to the subject of sanitation, and lectured for the National Health Society for several years. Mrs. Ballin devoted herself especially to the hygiene of children, and produced a monthly journal entitled "Baby, the Mother's Magazine," which is still current and which was followed by "Womanhood," an illustrated journal dealing with feminine matters in general. Mrs. Ballin has published an extensive series of works, the first of which was a "Hebrew Grammar with Exercises," written conjointly with her brother, 1881. This was followed by: "The Science of Dress in Theory and Practice," 1885; "Health and Beauty in Dress," 1892; "Personal Hygiene," 1894; "How to Feed Our Little Ones," 1895; " Bathing Exercise and Rest," 1896; "Early Education," 1897; "Children's Ailments," 1898. 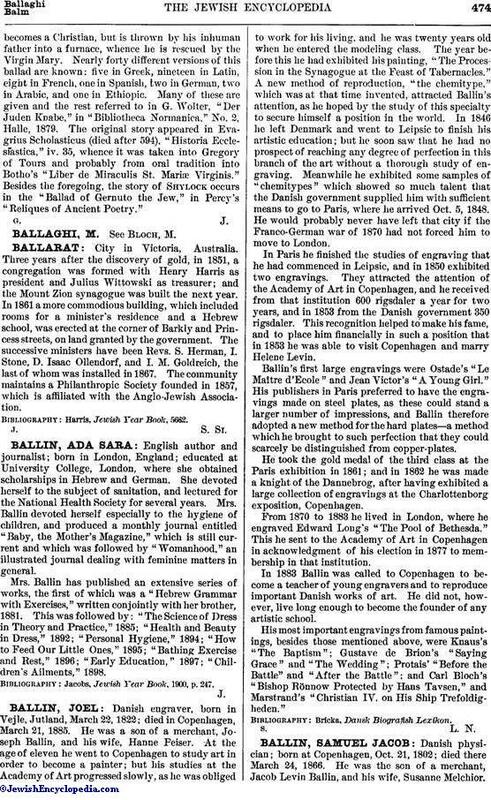 Jacobs, Jewish Year Book, 1900, p. 247.